The advantage of getting more light onto the sensor is the camera can use a faster shutter speed, and avoid image blur. It also means you get richer colours in low light, as well as being able to shoot in much lower lighting conditions. The Sony DSC-HX5V has some very cool tricks up its sleeve. One of these is the intelligent sweep panorama function. This is my favourite feature and I use it all the time. The Sony DSC-HX5V basically takes about 10 photos as you move the camera in an arc, and then the pictures are stitched together into one long photo. The intelligent part refers to the cameras ability to edit out people who move across the image as you are shooting. I have had this prove invaluable a a guy walked in front of me as I took a photo and yet he was only at the start of the picture, even though he had been moving across the picture as I was taking it. Very cool. The Sony DSC-HX5V has another nifty function called hand held twilight. When its too dark to take a photo without tripod, the camera can use this mode to take a burst of photos and then it stitches them them together into one image, that is sharp and properly exposed. It can also detect if it is on a tripod or stable surface and just take the normal long exposure too. The HDR(high dynamic range) function is for those tricky lighting situations like when someone standing in front of a window. Normally you could either get the person exposed correctly or the window, but not both. The HDR function takes 3 photos in a burst, but changes the exposure of each picture to capture all elements. The Sony DSC-HX5V then stitches all the properly exposed parts of the photo together to give you a final picture that has perfect exposure despite the extremes of light involved. The Sony DSC-HX5V ” only” has a 10 mega pixel sensor but although you can get camera’s with higher, you will struggle to find any that take a better picture. The “G” series used in the Sony DSC-HX5V is of the highest quality, and as all good photographers will tell you, the best image sensor is useless if you don’t have a great lens. The “G” designation means the lense has been designed specifically for the camera, and is not an off the shelf item. The lense has a 10 times zoom, making it perfect for everything from landscapes to sports photos. It will even let you take great natural photos of the kids, from a distance, so they don’t put on their photo faces, like they do when they know your taking the picture. The intelligent auto setting, which I use 90% of the time, chooses between about 90 different variables to make sure you get great results. It uses a combination of Sony’s advanced face recognition, with other sensors to ensure you get the picture right. It even has an easy mode so your grandma can take pictures without getting overwhelmed by any complexity. The large image sensor also allows you to take photos without a flash indoors. 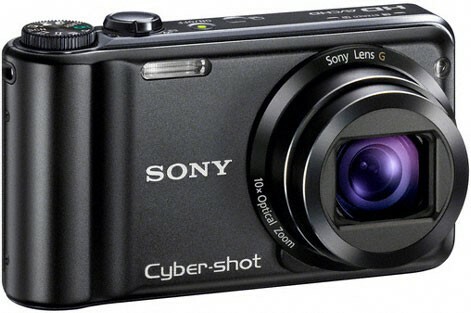 The Sony DSC-HX5V can also shoot AVCHD high definition movie’s too. This makes this pocket friendly camera a virtual Swiss army knife of the camera world. Despite all of the advanced functions, the camera is very easy to use, and Sony has included a brief overview of what each function does, so even a photographic novice will get the most out of it.